U.S. house prices kept marching higher in July, according to the S&P CoreLogic Case-Shiller home price index. The 12-month price increase among 20 cities was 5.8%, up from the June pace of 5.6%, about triple the general rate of inflation. 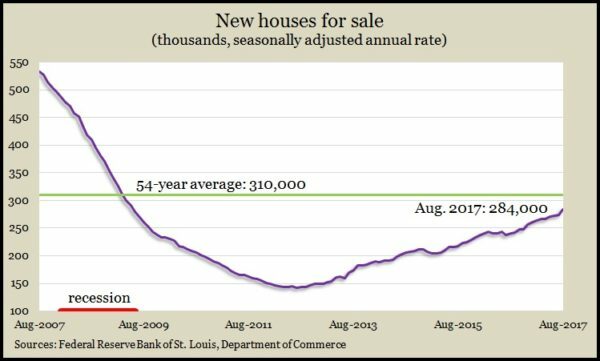 A housing economist with Standard & Poor’s said some indicators may be leveling off, including home sales. He expects hurricanes in the southeastern states to bid up the cost of building materials, furthering price pressures on new houses. He added that Federal Reserve Board plans to unwind $4.5 trillion from its balance sheet could raise mortgage rates, adding to the costs of homebuyers. As evidence of a slowing housing industry, the Commerce Department reported that sales of new houses declined in August for the second month in a row. The government announced that an annual rate of 560,000 new houses sold in August, down 3.4% from the July rate and down 1.2% from August 2016. The median sales price continued to increase, and although the number of new houses for sale rose to the highest level since the recession, they’re still 11% below the long-term average. The Conference Board said consumer confidence retreated in September but mostly by respondents in areas affected by Hurricanes Harvey and Irma. Otherwise, the business research group said, Americans remained upbeat about current economic conditions, and there is a widening lead of optimists over pessimists in terms of outlook, especially for jobs and income. The Conference Board’s confidence index suggests continued moderate economic expansion. Durable goods orders rose in August following a steep decline in July, which followed a sizable leap up in June. Data from the Commerce Department showed volatile orders for commercial aircraft causing the wide swings. Excluding transportation equipment, orders nudged up 0.2% from July and up 5.3% from August 2016. A telltale indicator of business investment rose an encouraging 0.9% for the month but was up just 3.3% from the year before. Some economists have warned that lagging business spending has been holding back productivity. In another sign of a slowing housing market, National Association of Realtors said its pending home sales index sank in August for the fifth time in six months. Hurricanes had an effect, but the trade association reported slowdowns across the country. The index suffered its fourth year-to-year decline in five months. An economist for the Realtors cited limited inventory and escalating prices. The group downgraded its 2017 sales forecast to 5.44 million houses, which would be down 0.2% from 2016. Its previous prediction was a rise of 3.2% from 2016. The U.S. economy grew faster in the second quarter than it has since the first three months of 2015, the Bureau of Economic Analysis said. The report showed gross domestic product climbing at a 3.1% annual rate, a tad above the previous estimate of 3%. Consumer spending, which drives 70% of GDP, accelerated at a 3.3% rate. Business spending increased for the second quarter in a row while housing investments fell. The Federal Reserve Board’s favorite measure of inflation – the core Personal Consumption Expenditure Index – came in at 0.9%, not even half the target rate of 2% annual growth. The moving four-week average for initial unemployment claims rose for the fourth week in a row, climbing about 16% since the hurricanes battered the Gulf Coast. Still, Labor Department data show the claims level remained 22% below the 50-year average, and weekly claims fell more than expected, suggesting employers are still cautious about letting workers go. That helps support a stronger job market, which should raise wages and fuel more consumer spending. The Bureau of Economic Analysis said personal spending rose just 0.1% in August. Measure from the year before, personal spending grew 2.5%, the lowest rate since February. Personal income rose o.2%, although wages and salaries were stagnant. The personal saving rate stayed at 3.6% of disposable income. In the same report, the Federal Reserve’s favorite measure of inflation showed a 1.3% year-to-year increase, marking its second consecutive decline. On a monthly basis, the Fed’s target rate of 2% has not been met since April 2012. The semi-monthly consumer sentiment survey from the University of Michigan indicates an annual consumer spending rate of 2.6% for 2017 and the first half of 2018. The sentiment index declined from its mid-month reading as well as from August, but through the first three quarters of 2017, consumers have been more confident than they have since 2000. An economist associated with the survey noted consumer resilience, having shrugged off such recent distractions as the hurricanes, North Korea, Charlottesville and ongoing political dysfunction in Washington.